Thanks for the e-mail today. I met with Jim Dyer and Nader Mamish and a few things have been decided. 1) NRC travelers that are in Japan and scheduled to return no later than May 3 will continue to be covered under AID funding. All vouchers and tickets will be done via the AID travel vouchering process. If one of these travelers change reservations and return after May 3 they will have to obtain an NRC ticket. and will have to voucher lodging and per diem from May 4 until their return through NRC. We must know of any changes so that we can create NRC Travel authorizations. 2) Chuck Casto since he is staying longer will be under an NRC travel authorization starting May 1. His return trip ticket will need to be booked through Mary Carter. I am checking on his charge card situation. Who will be setting up Chuck’s new orders and how would you like to transition his hotel reservations. I can talk to embassy travel to effect his hotel transition. 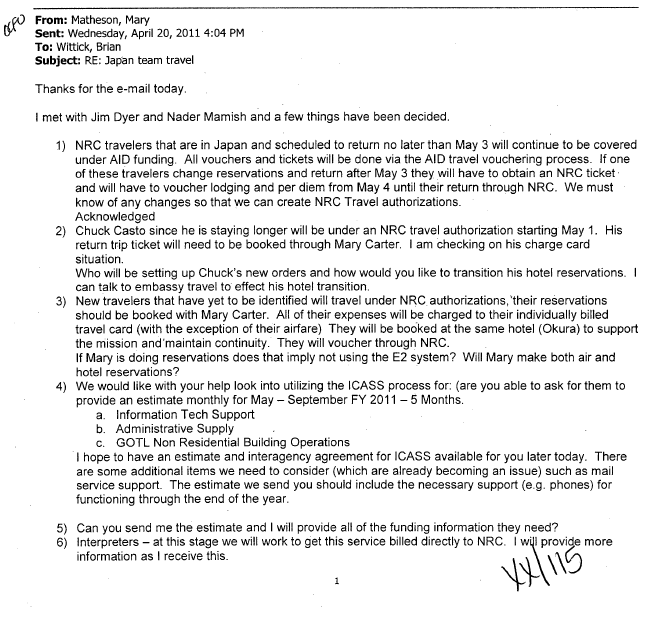 3) New travelers that have yet to be identified will travel under NRC authorizations,’their reservations should be booked with Mary Carter. All of their expenses will be charged to their individually billed travel card (with the exception of their airfare) They will be booked at the same hotel (Okura) to support the mission and’maintain continuity. They will voucher through NRC. If Mary is doing reservations does that imply not using the E2 system? Will Mary make both air and hotel reservations? 4) We would like with your help look into utilizing the ICASS process for: (are you able to ask for them to provide an estimate monthly for May – September FY 2011 – 5 Months. I hope to have an estimate and interagency agreement for ICASS available for you later today. There are some additional items we need to consider (which are already becoming an issue) such as mail service support. The estimate we send you should include the necessary support (e.g. phones) for functioning through the end of the year. 5) Can you send me the estimate and I will provide all of the funding information they need? 6) Interpreters – at this stage we will work to get this service billed directly to NRC. I wTi provide more information as I receive this. I spoke to the financial office. They do not recommend going. outside the embassy contracting on this as the embassy gets a good discount on their interpreter contract and there are embassy access issues as well. We are working to try to significantly reduce our usage of interpreters (grouping usage to cut hours, getting the embassy to cover meetings they have lead for, etc), so we hope to bring the costs way down on this. Are you able to check this with Surin to ensure that we have not missed anything? I look forward to hearing from you. The estimate will come from Yoriko in the embassy finance office (the ICASS officer) but I am working with Surin as well.